Now submit your manuscripts to Bulletin of the Menninger Clinic with our new online manuscript submissions portal. 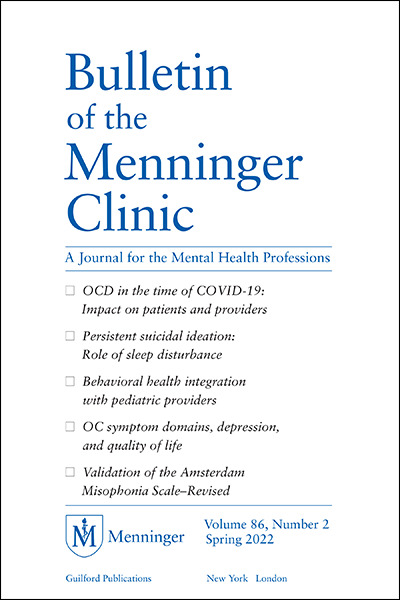 The Bulletin of the Menninger Clinic has a long and distinguished history, publishing seminal works in psychiatry and psychology since 1936. With the goal of continuing—and further expanding—its impact, the Bulletin will place its primary focus on psychopathology research that is broad based. In particular, the Bulletin will publish manuscripts of sound methodology and clinical significance over a range of topics pertaining to psychopathology, assessment, and intervention without adherence to a particular theoretical orientation. The Bulletin will serve as a forum for researchers and clinicians to present original research focused on psychopathology as well as assessment and intervention. Original research will be evaluated based on its methodology, significance, and fit with the Bulletin’s focus. Literature reviews will be considered, provided the review is targeting one of these domains. The Bulletin is also interested in psychometric studies of new measures, as well as replicating past work. Finally, case studies that present unique clinical presentations and approaches to treatment delivery will be considered. The Bulletin continues its reach to a wide range of individuals in mental health research and care, including psychologists, psychiatrists, therapists, nurses, and those in graduate training.